We've all heard of Jack the Ripper, Ted Bundy, and the rest, but in Lady Killers, Tori Telfer dives in to the significantly less explored area of female serial killers. Each chapter focuses on a different monster, some that you may have heard of—Elizabeth Báthory, aka the Blood Countess—but most that you haven't. Pro tip: If a woman's hanging around outside your building asking if any old men live there, she's probably looking for a new mark. Hide the arsenic! 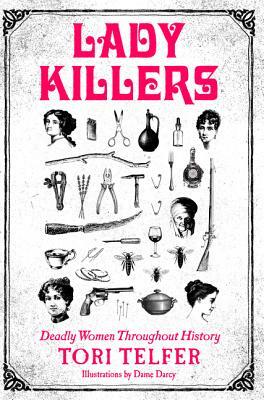 Inspired by author Tori Telfer's Jezebel column “Lady Killers,” this thrilling and entertaining compendium investigates female serial killers and their crimes through the ages. Lady Killers, based on the popular online series that appeared on Jezebel and The Hairpin, disputes that claim and offers fourteen gruesome examples as evidence. Though largely forgotten by history, female serial killers such as Erzsébet Báthory, Nannie Doss, Mary Ann Cotton, and Darya Nikolayevna Saltykova rival their male counterparts in cunning, cruelty, and appetite for destruction. Each chapter explores the crimes and history of a different subject, and then proceeds to unpack her legacy and her portrayal in the media, as well as the stereotypes and sexist clichés that inevitably surround her. The first book to examine female serial killers through a feminist lens with a witty and dryly humorous tone, Lady Killers dismisses easy explanations (she was hormonal, she did it for love, a man made her do it) and tired tropes (she was a femme fatale, a black widow, a witch), delving into the complex reality of female aggression and predation. Featuring 14 illustrations from Dame Darcy, Lady Killers is a bloodcurdling, insightful, and irresistible journey into the heart of darkness.